Tyler had a race at Firebird East yesterday. It was hot and Tyler’s kart was oversteering on almost every corner. His main competition, Mike Laycook, commented that it looked like Tyler was going through the corners sideways. It may be the “fun” way to drive the car and looks “cool” but it is the slowest way around the track. After a horrible practice session where Mike just drove away from Tyler once he got around him we played with tire pressures to try and find some more grip. In practice he had gone out with the pressures set at 10 lbs so we dropped them to 8 lbs. I also loosened the rear bumper to try and dial some of the oversteer out of the kart. 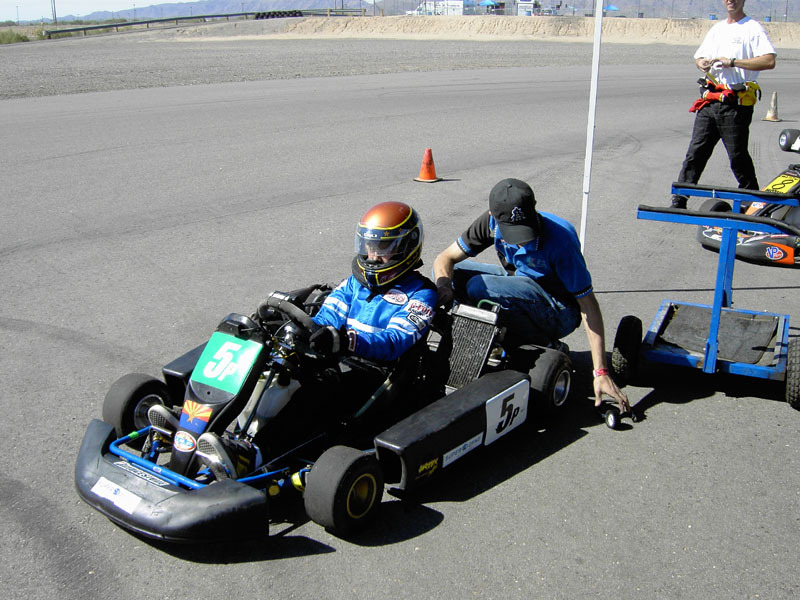 Our transponder (just back from being repaired) was not working so we did not get any lap times and our Mychron dash also decided to stop working so we were not able to capture any data so that I could see how the kart was performing. 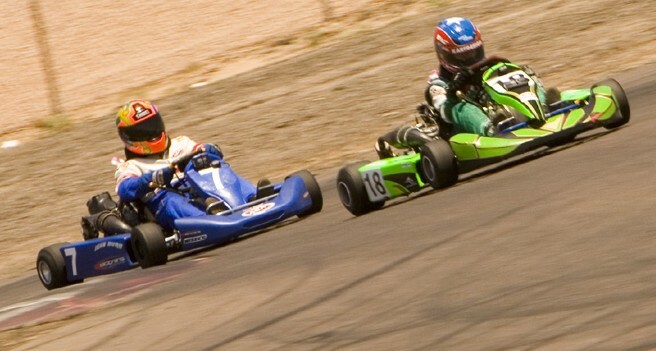 Tyler and I went out to run an IKF race with SoCal Karters for an event at Firebird East on Saturday and then with our own local club on the West Track the next day on Sunday. Had a couple of famous drivers/riders out with us this weekend. Eddie Lawson four time Grand Prix bike World Champion (MotoGP 500cc biles) 1984, 1986, 1988 and 1989 (http://home.ama-cycle.org/forms/museum/HOF/hofbiopage.asp?id=74) was out running his 250cc Shifter Superkart and his friend and fellow three time consecutive Grand Prix bike World Champion (MotoGP 500cc) 1990, 1991 and 1992 Wayne Rainey (http://home.ama-cycle.org/forms/museum/hofbiopage.asp?id=86) was out to watch. Even though Wayne suffered a career ending accident in 1993 when his bike hit him breaking his back and leaving him in a wheelchair he too has a SuperKart setup with hand controls but was just out to watch and not drive this weekend. Saturday (Apr 16) we were back out at Firebird East for a joint event with Southwest Karters and the Southern California Karters groups. First practice session was cut short when a senior 125 kart punted Tyler off into the right hand “S” on the freeway straight. After that we got the Jr. 80’s moved out of the 125cc and 250cc shifter group and into the TaG, Laydown and Junior kart sessions. Yesterday (Sunday, April 3, 2005) was Tyler’s first time to drive the East Track at Firebird (http://www.firebirdraceway.com/2005web/2005_facilityrental.htm). The goal of attending this session with Southwest Karters (http://homepage.mac.com/kartdesign1/SWKR.html) that was hosted by ProAutoSports (http://www.proautosports.com/) so that Tyler could continue to work out the requirements of his kart and what he needs to do as well as familiarize himself with this track (he has now driven at Phoenix Kart Racing Association’s (PKRA – http://www.pkra.com) sprint track as well as the West Track at Firebird). ProAutoSports had set aside three sessions for the karts and they gave us access to a really nice covered facility right at the exit of the pits and across the turn 8-9 complex. Yesterday I took my twelve-year-old son, Tyler, out to a SWK event on the 1.1 mile west track at Firebird. 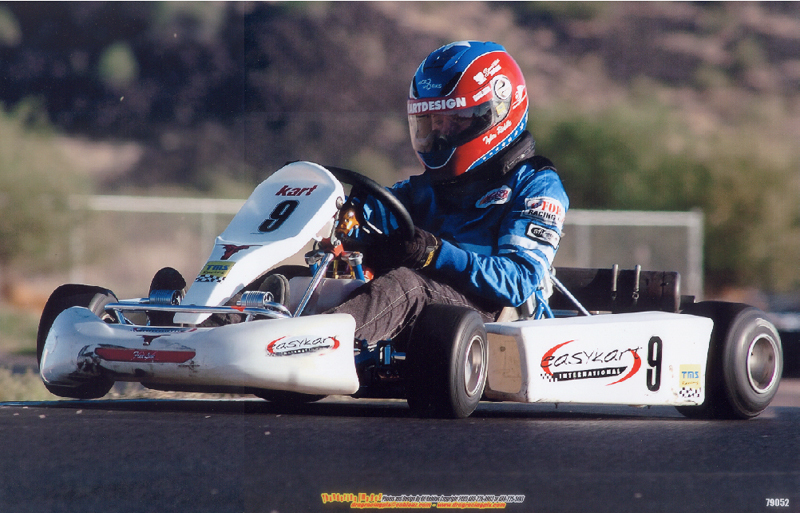 He would be driving his new (to him, anyway – 1999 CRG chassis) CR-80cc powered shifter. Prior to this event he had done two test days with about four sessions each time out. Because this was to be his first time actually running the kart in competition we elected to keep him on the used tires that were on the kart since we did not think he would be up to speed yet since he is still getting used to shifting. A full moon and April Fools Day! Perhaps it was that combination that made for an eventful day. Once again a record turn out. But we learned a bunch of things. And we can fix them. The line ups will be better – Sorry ’bout that. The pit area will be better – Main Track! The race will be longer – 30 minutes. We will all have a better understanding of how we do things. Be ready for a meeting in the morning. We will get done earlier in the day. Can’t help you on how hot it will be. The race will only be on May 6th. None of the other tracks were available on Saturday. Of course Friday practice is available. We’re looking at different track configurations too. As usual, the results will take a few days. The top finishers are correct though. Info about June/Fontana will be here soon. Looking like a kart only deal for us right now. That was NOT our usual event. Next race is on April 2nd on the East track again. If you would like to practice on the Friday before the race, you need to contact me or pre-register. We need to make sure we have a big enough turn out to make it worth doing.